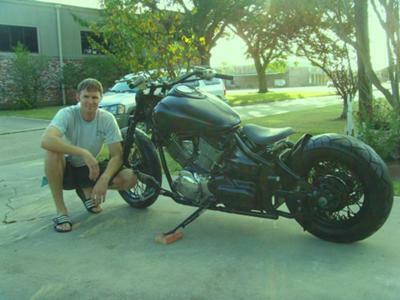 I wanted a cool bike but I didn't have the money to buy a ready to go chopper or bobber. I always kind of turned my nose to the Japanese bikes until I realized if I wanted a cool bike that I could afford I would have to buy a Asian made bike and Americanize it. 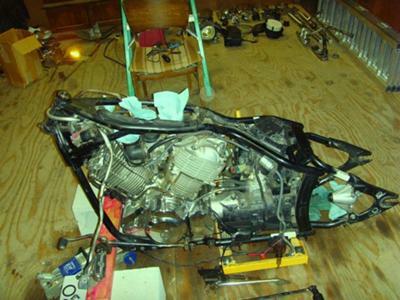 I paid $900.00 for a 1999 Yamaha 1100cc that didn't run. I invested 1100.00 more dollars with a total spent being 2000.00. It took me about four months to finish the bike. 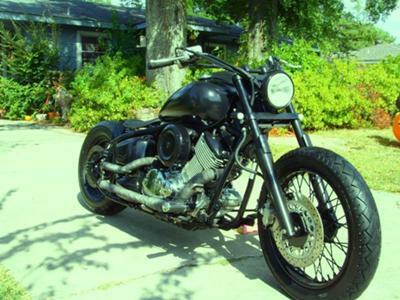 This Americanized Yamaha Bobber was my first bike project I hope to do about five more of these so that I can raise enough money to build my own rolling chassis. The first two pictures are before shots and the last two are after shots. Hope you like. Thats pretty sweet looking bike. I'm currently doin a little choppin and grindin on my 04 V Star 1100. 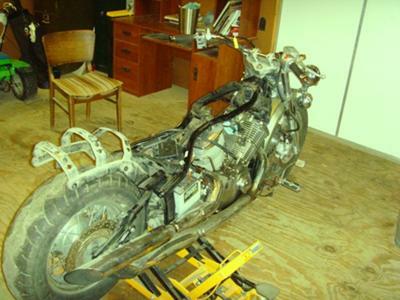 My question is, did you make it a rigid or just slam it I cant really tell from the pics. Anyway if you have any more pics ir details lee me know.